I never tire of Laura Ingalls Wilder’s books no matter how many times I’ve read them, which at this point in my life is many. 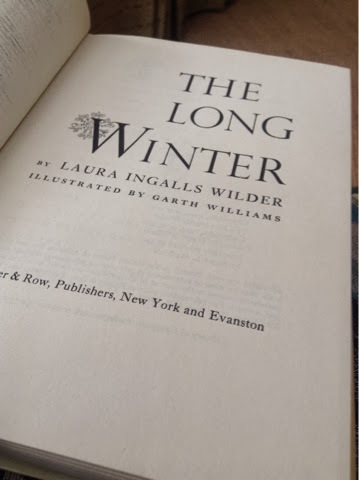 It seemed like a good time to pull down The Long Winter, one of my favorites in the series, and I’ve been reading it all evening. Now I tell my children of my childhood, when the televisions were black and white with only four channels: NBC, ABC, CBS, WGN and if we were lucky, PBS. My mother woke us up in the middle of the night, after warming up the TV, so that we could watch Neil Armstrong take his first step on the moon in 1969. The telephones had real operators at the other end, people who could connect you to the person with whom you wanted to speak so that you didn’t even need to dial the phone. It was a glorious day when wall phones with push buttons were installed, the cord so long that my mother could move about the kitchen while talking to my aunt never caring one bit when the rubber caught on fire from being suspended over the stove for too long. There were no XBoxes, video games, iPhones or iPods. There were doll houses for which I sewed sheets and curtains. There were watercolours with which to paint like Beatrix Potter. There were books to bring home from the library every week. Books which filled my life then as powerfully as they do now. It’s all relative, I suppose, how much technology effects us. How much it may, in fact, keep us from relying on ourselves. And we wrote letters! And got them! I wonder if anyone anywhere does that anymore. Oh, the letters…how I would wait for them from my husband, while he waited for me in Germany before we married, and the sight of a thick letter filled with his writing is one of the happiest memories I have. My husband and I sat down many years ago and wrote a list of all the new gadgets that our daughter either had or wanted, but were missing from our own childhoods. That list would now be twice at long! I, too, read all of these books back in the late 60s and remember longing for a life like Laura's. I was going to read The Long Winter last year, but got distracted. Maybe I should try today. I'm sure it's a quick read. Thanks for the memories, Bellezza! Oh, and I meant to mention that I still prefer looking at a paper map/road atlas than relying on gps. Rod prefers the latter, so we use both. I think this book is fitting because come February it always seems like we have had such a long winter!! I still really like letter-writing… For me, it is postcards, though! Les, I began The Long Winter last night and just finished it now. I can't tell you the power these books have over me (but probably you already know). It wouldn't take you any time at all, as I'm sure you read more quickly than I.
I've made such a list of “what we had then vs. what we have now” for teaching when I've been so lonely for my stick of chalk and chamois eraser. The technology which is supposed to be helpful only serves in requiring us to do everything twice. Glad you have your grandmother's letters to read and reread. Glad we have our paper maps, the only things which, in the end, really prove reliable to me. February does come with a bit of the feeling, “When will this ever end?” Laura's family waited until the end of April for the train to bring supplies. I can't imagine the determination and strength they had to survive, and yet I realize how much of the character and wisdom presented in these books reiterated the lessons my own parents were teaching me. As for postcards, they seem more manageable to write. Not as long, with the added benefit of a beautiful picture on the front. You know my prejudices, of course, but I recently found this NY Times article which only confirmed me in my prejudices. After three years without television, I have no regrets. I have yet to experience any inability to find a place I want to find, even without GPS, and I've found many places – and many people – technology would have zoomed me right by. There's nothing like stopping to ask directions or questions to make traveling fun. And yes, I still have a flip phone. If I have to evacuate for a hurricane or other unpleasantness, I can send a text if a call won't go through. Otherwise, I don't bother. I am a little out of touch with popular culture, I suppose, but every time I bump up against it (Miley Cyrus? Late night tv wars?) I remember why I've made certain choices. It was 1954 when I was introduced to the “Little House” books. My fourth grade teacher read a good number to us aloud. Maybe every one. They helped to flesh out the photos we had of certain family members, who lived in soddies on the Nebraska prairie. In many ways, I'm in the process of recreating that life – albeit with air conditioning and a nice car. I meant to ask you if you've read O.E. Rolvaag's Giants in the Earth? I read it years ago for a Great Plains Lit. course and it reminded me of a grown-ups version of the Ingalls' books. I have to read the article to which you linked, but I feel that you and I are on the ame side, Linda. If there is such a thing as sides. Well, we both like simple, and real, and what is essential. Which, of course,rarely includes anything on tv, and never includes Miley Cyrus. How lovely that your teacher read several of the series to you. It's so interesting to me that whenever I read these books to my class, which isn't every year, they love them, too. Who knew, this technology crowd of kids smarter than I will ever be with all their gadgets? I haven't read this book, nor have I taken a course on Great Plains literature, but how wonderful that would be. I remember our town when it was farmland, and I sorely miss the beauty of prairie, or at least open fields. Thanks for directing me to Becky's post, Suko. How fun that several bloggers have chosen to (re)read this book this winter! What a wonderfully witty and clever response! I love your sense of humour, Rod. Les is a lucky girl to have you around. I work with people who can't believe that I didn't have a mobile phone or internet during high school…technology has the power to make us old, very quickly. What a lovely, thoughtful post. I tend to be very backward about technology – a mobile phone that's 12 years old now (my son just starts to laugh when I use it), no ipad, no kindle, not even a decent television box! But that's because all I really want to do is read. With every change we gain something and we lose something – it's always worthwhile keeping an eye on the losses. Sometimes it's nice to make sure that we get them back in other ways. I've never read them but I'm waiting for my kiddo to be old enough to read them with me. I want to discover them together. I spend a good deal of time ruminating on this. How different Greyson's life will be from my years growing up. And I love Laura Ingalls Wilder. I find myself re-reading Little House in the Big Woods the most, but I remember loving this one, too. I think about how different my growing up years were from those of my granddaughters. They are sometimes quite baffled by my lack of attraction to some of the things they like and take for granted. Also, remember party lines? We didn't have one, but my grandparents did. I loved and continue to love the Little House books. The Long Winter is probably my favorite. Wonderful quote! Something that Violet Crawley of Downton Abbey would say. I was raised with b/w TV, and watched Lone Ranger, Rin Tin Tin, Lassie, The Waltons, and many other shows after school. Love this post! And, we can't even imagine how it will be when Greyson has children of his own! They'll probably laugh at the iPhone4s I was so proud to buy. Isn't it hilarious how baffled the 'children' are at our childhoods? Talk about feeling like Laura Ingalls Wilder myself at times! I do remember party lines. I remember picking up the phone and listening to whole conversations others were having. Good thing there was nothing scandalous going on! I remember Rin Tin Tin, Lassie, The Waltons, and Flipper, Petticoat Junction, My Three Sons. So many great shows, usually with a lesson of some kind at the end.